A few steps from the Ponte Vecchio, in the popular neighborhood called the Oltrarno, surrounded by some of the most characteristic streets of Florence, it suddenly appears: the Pitti Palace, the former residence of the Grand Dukes of Tuscany, inhabited over the centuries by the Medici, Lorraine and Savoy families. At the time it was built it was the largest residence in Florence and the most opulent. Even today, the Pitti Palace is perhaps the most impressive building in the whole of the city. The palace was built for the Pitti family in 1457, designed by Filippo Brunelleschi and erected by his pupil Luca Fancelli (Brunelleschi died 12 years before the building was completed). In 1549, the palace was sold to the Medici, in particular to Eleonora of Toledo, wife of Cosimo I, who preferred the Oltrarno area and didn’t like living in the Palazzo Vecchio, which she considered "narrow"! Later, Palazzo Pitti was further expanded based on plans by Bartolomeo Ammannati (around 1560), with the addition of the large courtyard (where extraordinary events took place, including a actual naval battle!). The square in front was expanded by Cosimo II de 'Medici. The two wings of the building, which extend around the square, are an eighteenth-century addition. As for the Lorraine, they also expanded the palace, and in 1833 Leopold II opened some parts to the public, as a museum. After the unification of Italy, Palazzo Pitti was given to the Savoy family and it was also home to the king in the short period that saw Florence as capital of Italy (1865-71). Today, Palazzo Pitti is primarily home to an important museum complex, as well as the beautiful monumental Boboli Gardens (about which we tell you everything, absolutely everything, here). 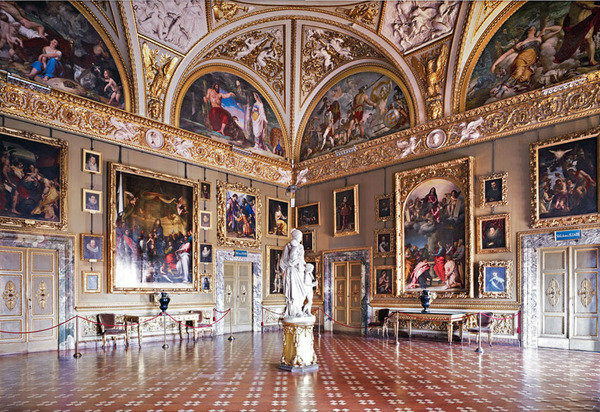 Palatine Gallery and Monumental Apartments The impressive collection of paintings of the Grand Dukes of Tuscany: 28 rooms that respect the original layout, with paintings in multiple rows, arranged following a decorative criteria. The gallery occupies some of the most beautiful halls in the building, on the first floor of the left wing, partially frescoed by Piero da Cortona. Inside there are masterpieces by Filippo Lippi (Tondo Bartolini), Luca Singorelli, Jacopo Pontormo, Rosso Fiorentino, Titian, major works by Raphael (such as the Madonna della Seggiola), Andrea del Sarto, Antonio Canova, Rubens, Van Dyck, Caravaggio (Amore Dormiente, a Cupid, in the bedroom of the Grand Duke). The Monumental Apartments are the 14 rooms of the Royal Apartments and the 6 Tapestry Rooms used by the Medici family and their successors. The decoration of the furnishings has changed since the time of the Medici and what we see today is mainly the layout from the Savoy era. Silver Museum The museum is housed in 14 rooms on the ground floor and in 13 rooms on the mezzanine floor, in the north wing of the building. It contains an extensive collection of priceless pieces of gold and silver, cameos, crystals, works in ivory and precious stones, as well as a collection of ancient vases that belonged to Lorenzo the Magnificent and the remarkable Medici collection of oriental porcelain. Hall V was an ancient chapel, while some rooms were the summer apartments of the Grand Duke. Modern Art Gallery On the second floor of the Palazzo Pitti, the Modern Art Gallery extends through 30 rooms, all in the main body of the building and in the north wing; it includes the Ballroom. On display are mainly examples of Italian painting from the late eighteenth century to the early twentieth century, including an important collection of paintings of the Macchiaioli. There are also important sculptures by Antonio Canova, Pietro Tenerari and Giovanni Dupré. Costume Gallery The Costume Gallery has been located in the Meridiana building since 1983, a pavilion that can also be reached from the Boboli Gardens. The museum houses a collection of over 6,000 pieces (partly kept in storage): old clothing, accessories, theater and film costumes. It is one of the most important museums of its kind in the world. Porcelain Museum The Porcelain Museum is located in the so-called "Casinò del Cavaliere", at one of the highest points in the Boboli Gardens. It preserves the ancient porcelain collection of the Grand Dukes and the Savoy family, coming from the most famous and noble European manufacturers. Carriage Museum The museum is housed in the Rondo of Porta Romana, the right wing of the Palazzo Pitti, home to the carriages and other vehicles belonging to the grand ducal court. Unfortunately, the museum has been closed for years, but there’s a plan to reopen it in the Rondo of Bacchus, where the former royal stables are located. The Pitti Palace is also the destination of the fascinating Vasari Corridor. Finally, some advice. The square in front of Palazzo Pitti, sometimes also called "the beach" due to its characteristic look, is a perfect place to rest and lie in the sun, to catch your breath during the intense days visiting Florence!